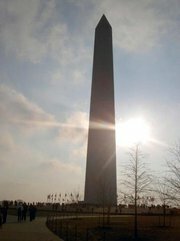 I never thought much of the Washington Monument. It's the least interesting of all the monuments in the District of Columbia. There's not much to look at. It's just really big. It's a popular image for postcards, particularly if the Cherry Blossom trees are blooming. It's almost boring--especially compared to all the other monuments. At least you could see a 19-foot Abraham Lincoln, a 19-foot Thomas Jefferson, a wheelchaired Franklin Delano Roosevelt and his Scottish terrier Fala, statues of soldiers in Vietnam or Korea, marines at Iwo Jima, a 17-ft Theodore Roosevelt. I didn't even know what FDR's dog's name was. I had to look it up just now. Fala has a statue in the District--a really cute statue, by the way--and what does the father of our country get? It doesn't even have waterfalls or fountains. It was kind of cool the one time when I went up to the top of the Washington Monument with my family when I was a kid, but once you've done that, what's the draw? Booor-ing. Then I moved to Falls Church, Virginia, which is maybe a 20-minute drive from downtown D.C. So you're going on with your life, having a tough week at work. You're worried about money. You're worried about gas prices. You're wondering if you're going to be able to eat before 10 p.m. today. Traffic's horrendous. Whatever menial little problems you have in your life. Then, as you're driving along, stressed out and maybe a little angry, out of the corner of your eye you spy the Washington Monument, rising above the city like a beacon. And you think, I'm in Washington, D.C. Hot damn. There's really nothing like unexpectedly catching sight of the Washington Monument. It's like being smacked with America. It's the sudden realization that you are in the capitol of the United States. It's also good for orientation when you get confused on the roads. For Independence Day last summer, Jonathan and I metro-ed into the District and watched the fireworks behind the Washington Monument from a grassy patch on the National Mall. It wasn't very impressive, as fireworks shows go, but they sure lit up the Washington Monument pretty. I will say that old George is probably well enough represented at his Mount Vernon estate, and the man got the honor of having the nation's capitol named for him. So maybe it's not that much of a slight that his monument is a giant white plinth instead of something with a statue. I still think it's pretty boring, as monuments go. No statues. No fountains. No reason whatever to get closer. But there's no need to get closer to appreciate the thrill of Oh. My. God. I'm in D.C.